Is it possible for a picture to hover in the strange never-never land of neorealism and magic realism? Well, it's improbable, but not impossible and if there's a picture that manages to do so whilst creating its own unique voice, then said honour belongs to the new film by Kire Paputts. Original, moving and transcendent, The Rainbow Kid leads us to the very heart of humanity. Impossible journeys to achieve even more impossible goals are the stuff dreams and good films are made of. Happily, Paputts gets to have his cake and eat it too with this lovely picture. The film has a surface sweetness and gentle demeanour which masques the darkness which can befall and/or threaten the innocent in a world rife with meanness. Eugene (Dylan Harman) has Downs Syndrome. His healthy obsession with rainbows leads him to embark upon an odyssey to discover the pot of gold which, it has been said, rests ever-so gently at the end of those splendorous bands of colour arching across the sky after a good rain. Like any great quest tale, Eugene experiences a series of episodic adventures along the way. Many of them take the form of meeting and relating to a variety of people including an old punk rock star played one of Canada's greatest character actors, Julian Richings. The film has an incorruptibility that borders on the whimsical, but happily never careens into the sickening tweeness of films, mostly of the French and Spanish persuasion, which annoyingly force us to bathe and/or drown in a septic tank full of treacle and bile. The tough-minded core always remains just below the surface, always threatening to impinge up Eugene. If anything, The Rainbow Kid is imbued with the tone so overwhelming in David Lynch's immortal The Straight Story in which old contemporary cowpoke Richard Farnsworth (The Grey Fox) traverses the highways of America on a lawn mower to reunite with his long-estranged brother. In both cases, humanity reigns supreme as the respective central characters transcend their challenges by an immersion in the challenges, tears, joy and, yes, meanness of others. 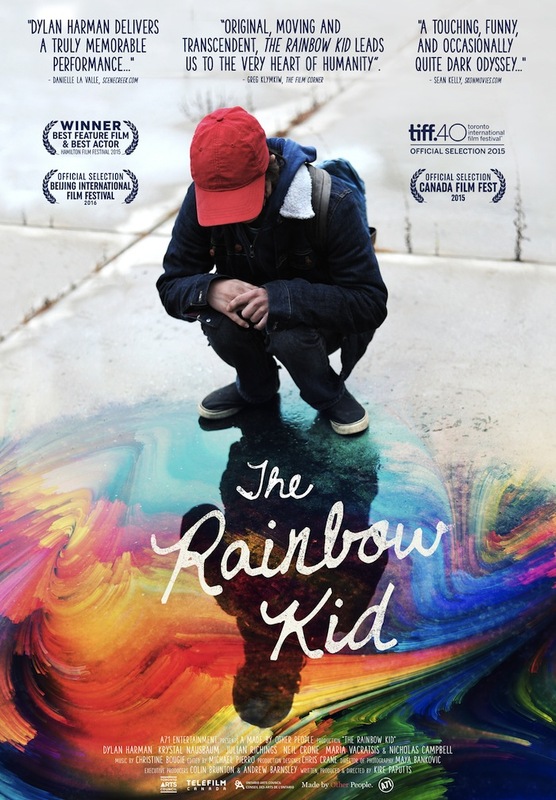 The Rainbow Kid enjoys a World Premiere in the TIFF Discovery section of TIFF 2015. For fix, dates, times and venues, visit the TIFF website HERE. The film will be released theatrically in Canada via A71.